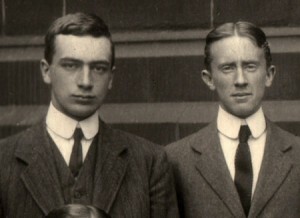 Robert Quilter Gilson (left) and Tolkien in 1910 or 1911. Photo courtesy of Julia Margretts. John Garth, writer, researcher and author of Tolkien and the Great War recently published online for the first time — with previously unseen photographs — a paper first published in Tolkien Studies 7 in 2010 (Tolkien Studies: An Annual Scholarly Review is an annual journal of scholarship on J.R.R. Tolkien and his works). Garth introduces the feature as follows: A salutary lesson in his youth taught Tolkien that fairy-stories are not only or mainly for children. Here I uncover the who, the where and the when. The anecdote appears among the pages written by J.R.R. Tolkien when he was revising and enlarging his original 1939 Andrew Lang lecture for publication in Essays Presented to Charles Williams, published in 1947. However, the passage itself was excised by the author and leaves no direct trace in ‘On Fairy-stories’. It finally appeared in 2008 in Tolkien On Fairy-stories, edited by Verlyn Flieger and Douglas A. Anderson, which includes Tolkien’s fascinating an extensive drafts of the lecture. BOOTNOTE: John has dedicated this article to his cousin’s four-year-old boy Charlie (who is also the grandson of the man who introduced him to the works of Tolkien). Charlie has cerebral palsy. Thanks to the amazing fundraising efforts of his parents, he has just had spinal surgery which could change his life. He has a chance to win £5,000 to pay for 100 hours of vital physiotherapy. It all depends on votes, and I hope you will take a moment to help him with yours. There are no obligations attached. To vote, please click here. UPDATE: John writes: You’ll be delighted to hear that Charlie, my cousin’s little boy with cerebral palsy, has won the £5,000 charity vote attached to my “Tolkien and the boy who didn’t believe in fairies” article. I’d like to thank you and readers of TheOneRing.net for your support with this –- in memory of Charlie’s grandfather, the man who introduced me to Tolkien and The Lord of the Rings. It was a race to the finish line and every vote counted. It means Charlie will get funding for 100 hours of physiotherapy to help him make the most of the dorsal rhizotomy operation he’s just had. He’s a fighter, and it seems this may put him on his feet at last. The webpage will still be dedicated to Charlie, who is going to need muscle-strengthening equipment and eventually an electric wheelchair, among other things for which his parents will have to raise the funds. I will maintain a link for donations via the registered UK charity Tree of Hope.